On the coastline there is a perfect crown of wonder. her name is caesarea. beautiful and worthy of admiration. Rebuilt with stones and adorned like a king's palace. Her Spirit will inspire you. Far away from the city and yet so nearby, in a quiet and a peaceful place on the seashore between haifa and tel-aviv, you'll find caesarea. an ideal place to relax to be carefree and enjoy yourself in neverending tranquility. Caesrea is one of the oldest cities in Israel, built by Horodus between the years 10-22 b.c. caesrea was big and magnificent, serving as the nasion's capital. The city's full name was "Caesarea Maritima", meaning caesarea on the seashore. Being located in the center of the country is one of it's remarkable Advantages. The archeological remains are a huge part of the city and a testimony to the prosperity that caesarea achieved. Throughout the years caesarea has been a source of attraction. She was always inhabited by Jews and in the 3rd and 4th century a solid Jewish community was established. Tourists, local and from abroad come to enjoy this seaside beauty. Villa for special family events are available. Music, bar, catering are optional. "Caesarea Vacation" specialize in marketing locations for conventions and events, conferences for corporations and public bodies for executives or fun days for companies to benefit their staff. 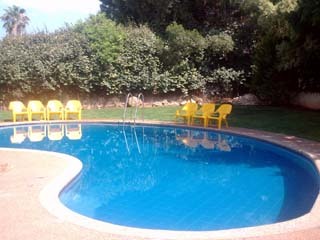 Short term leases, day use, weekly rental, monthly rental for any purpose, renting a location for filming commercials, rooms in villas, romantic attractions in an attractive land- Caesarea. All contents © copyright from 2004 - onward. All rights reserved to nofesh10.net owners.